The African Barred Owlet was first discovered in 2005; in the dry forest at Bat Cave in Shai Hills Resource Reserve. The Shai Hills Resource Reserve is located in the north-east sector of the Accra Plains. It includes an extensive system of inselbergs, surrounded by sparsely-wooded grassland. The granite hills rise 100-200 m above the plain and are forested with a patchwork of dry, mostly deciduous woods. This has the advantage that in the dry season, the forest is so light that birds can be found even inside treetops. The reserve suffers from an invasion by the exotic Neem tree (Azadirachta indica), which forms thickets around the base of the hills, spreading into the grassland as well. The dry forests and thickets of the Shai Hills Reserve are part of the drier section of the forest/savanna transition zone. This zone is called Guineo-Congolian/ Sudanian transition zone. Most deciduous trees are e.g. Baobab (Adansonia digitate). Neem grows back vigorously after bush fires and faster than native species. Since 2009 the local manager has applied a policy of clearing Neem thickets. African Barred Owlets are sometimes split as Etchécopar’s Owlets. 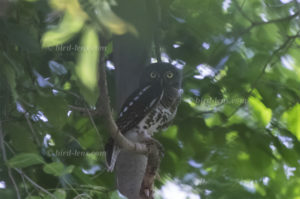 The owl is normally labelled Glaucidium etchecopari but the scientific name Taenioglaux etchecopari exists as well. African Barred Owlets occurs over much of central, eastern and southern Africa, with an isolated population in Ghana and the Ivory Coast in west Africa. The habitat in western Africa consists of primary and old secondary forests with high trees. It used to said, that its distribution reaches only from Liberia and the Ivory Coast and possibly in Ghana as well. The African Barred Owlet is now seen in the dry forest by ecotourists with the help of tape playback. To cope with the growing demand for top shots of the rarer species of the Palearctic Bird-Lens is keen to enrich the range of pictures of birds not only in the western Palearctic. Trips to remote places like this one to capture images were very successful. The nice image of the blog is only a first impression, what you will find in the gallery in the “Picture Shop” very soon. Just give bird-lens.com a message, if www.bird-lens.com could serve you with an image needed before the new pictures are online.